Growing frustration about the weather. What can we do? 2017 has been a very wet year. But you already know that. 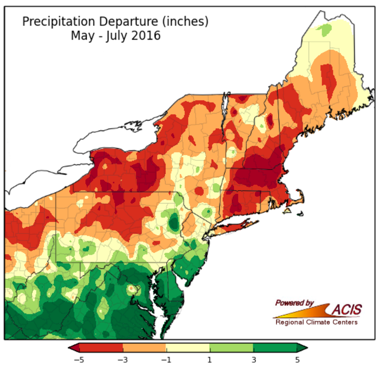 From May to July, most of upstate New York received at least five inches of rain above normal. But go back to 2016 and the same areas had deficits ranging from one two five inches. That’s a real drag. How are you supposed to plan ahead when it seems impossible to predict what will happen? It seems like every growing season is different. What our parents and grandparents knew about weather patterns on the family farm may no longer apply. The Network for Environment and Weather Applications is a useful resource for fruit and vegetable growers when it comes to understanding how changing weather conditions affect your operation on a daily or weekly basis. For example, online tools such as our apple scab and fire blight models help you understand disease risk and subsequent action steps on a daily basis to protect your apples. But what about the bigger picture? As growers, how do we even begin to predict management needs in the upcoming season when historical patterns and family knowledge may no longer be as useful? Precipitation, drought, extreme weather, extended growing season and so on are all hitting us at once. Our climate is changing. Dr. Allison Chatrchyan, director of the Cornell Institute for Climate Smart Solutions has taken steps to explore this ‘big picture’ dilemma by collaborating with Cornell professors Dr. Art DeGaetano and Dr. Toby Ault, as well as regional Cornell Cooperative Extension specialists throughout New York State who form the Climate Smart Farming (CSF) Extension Team. 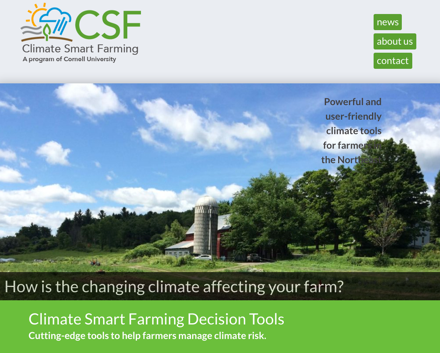 Online climate smart decision tools have also been developed to complement the work of CSF Extension Team members. Visit the Cornell Climate Smart Farming website to explore these resources related to agriculture and climate. Where NEWA looks at short-term risks posed by insects and diseases to a crop, the CSF program takes a broader view, providing historical context to current conditions and seasonal trends. 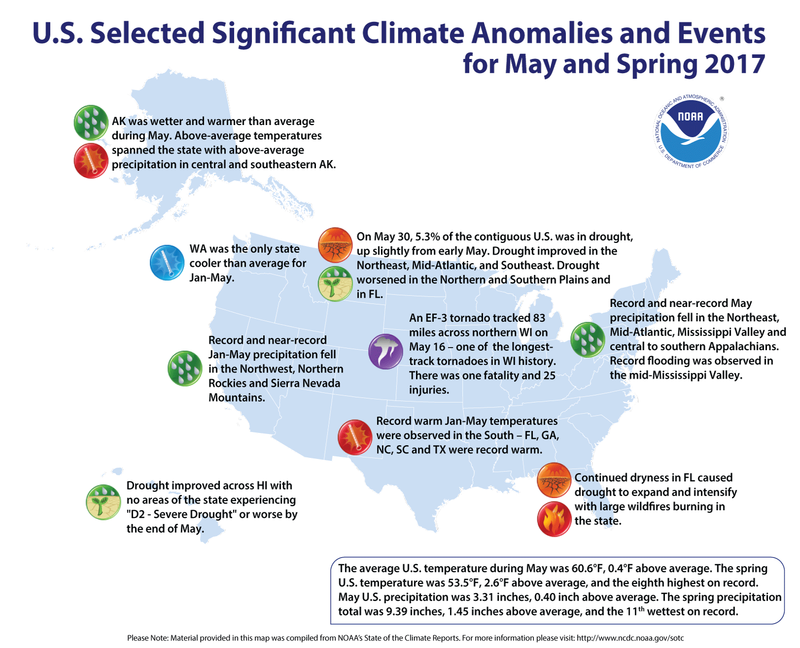 By doing so, growers can move in a direction of understanding ways in which fluctuating climate conditions could influence farming operations. Dr. Chatrchryan provides a great overview of the CSF program in this video. Her talk, Cornell’s Climate Smart Farming Program: Research, Tools, and Extension Support for Farmers in New York and the Northeast, was presented at the 2016 New York State IPM Conference Climate, Weather, Data: Protecting Our Crops and Landscapes. You can also download a PDF of Dr. Chatrchyan’s presentation. Dan Olmstead is Coordinator of the New York State IPM program’s Network for Environment and Weather Applications. You can follow him on Twitter (@dolmstead) and Instagram (@dan_olmstead). 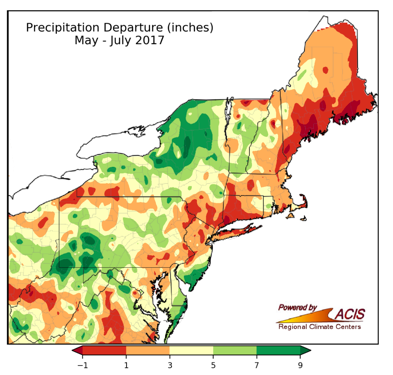 This entry was posted in climate, Climate Smart Farming, extreme weather, farming, Partners and tagged extreme weather, farming, new york, northeast, planning on August 31, 2017 by Dan Olmstead. I was at Empire Farm Days working the New York State IPM Program booth last week. What do you think the most asked about topic was? Every question I answered was about ticks. This one is a Lone Star Tick, not to scale (they are much smaller). Ticks are probably most well-known as carriers of Lyme disease, and populations are on the rise in New York. Changing weather and climate patterns could be partly to blame. Growing seasons are getting longer, and ticks have more time to develop. Range expansion is another likely factor that coincides with increasing deer and mice populations. These animals pick ticks up in one area and carry them to new un-infested locations. Typically by August, it is too hot and dry for ticks to seek hosts by questing, an interesting behavior where they crawl up grass. Joellen Lampman, School and Turfgrass iPM Extension Support Specialist with the NYSIPM Community program, has not observed the usual summer decline in dog tick and black-legged tick questing behavior this year. Ticks like to quest when humidity is greater than 85%, and 2017 so far has been favorable. Ticks are a concern because of their ability to transmit, or vector, human diseases. Lyme and Rocky Mountain Spotted Fever are often in the news, but others are also of concern, depending on tick species. Bryon Backenson is a scientist with the Bureau of Communicable Disease Control at the NYS Department of Health. In 2016, he talked about ticks, vector-borne diseases and distribution at the 2016 New York State IPM Conference, Climate, Weather, Data: Protecting Our Crops and Landscapes. In his presentation, ‘Climate and Trends in Vector-borne Disease in New York‘, he summarizes recent changes in tick born illnesses throughout New York State. Overall, cases are on the rise in both rural and urban areas. There are practical steps you can take to reduce the risk of vector-borne disease from ticks. The Community IPM Program offers several online resources including Understanding and Managing Ticks – A Guide for Schools, Child Care and Camps and What’s BuggingYou? – How to deal with ticks. NYSIPM and the Community IPM Program will be developing additional tick education and informational resources for New York State audiences in the coming year. New England states have dealt with ticks for a longer period of time and many resources are available from the region. University of Rhode Island has developed an online resource called Tick Encounter. You can find information about tick identification and guides, getting your clothing professionally treated and more. The University of Connecticut Experiment Station has also published a Tick Management Handbook. The Centers for Disease Control also provides an overview of tick management. Protection from biting insects and ticks is an important part of prevention. Choosing the right repellent is an important step in the process. Consumer Reports has a useful article that reviews insect repellents to help you choose the right product. Special thanks to M. Frye, J. Gangloff-Kaufmann and J. Lampman for supporting information. This entry was posted in Human health, IPM, ticks and tagged anaplasmosis, babesiosis, disease, erlichiosis, information, lyme, new york, pow, powassan virus, rocky mountain spotted fever, stari, tick, tularemia on August 23, 2017 by Dan Olmstead.